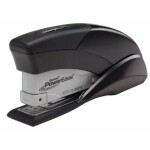 Amazon offers its Amazon Prime members the Swingline Optima PowerEase Reduced Effort Stapler in Black, model no. S7087850A, for $7.99. Non-members can spend over $25 for free shipping; otherwise, shipping adds $5.58. 25-sheet capacity with consistent, superior performance. Jam free guarantee, from 1st staple on the strip to the last, when used with Swingline® S.F.® 4® Premium Staples. QuickLoad(TM) magazine release simplifies staple loading. Front loading magazine holds full strips of 210 staples. Durable metal construction for maximum performance.